I’ve noticed that earlier, Manjaro uses for Gnome the gnome-shell-extension-arch-update in their system and let’s Pamac perform the update. I don’t know why they chose to do that, but there must be a reason for it. I myself use the same shell extension, but use the terminal for updating. The only thing I’ve changed is the command into yay -Syu. In that case it also checks the AUR updates. What about icons is also on GNOME? @ringo32 Gnome itself do not support the so called legacy Tray anymore, but gnome-shell-extension-arch-update is working, and yes only under GNOME. FYI, I don’t see any changes in terms of sys tray on my three installations of Antergos with KDE. The icons used in the app have changed, but that’s the extent of difference from before. If sys tray doesn’t work on KDE for new installations then it is likely that the Antergos installation has regressed. EDIT: Oops, that came across as a bit rude. I also notice some delay of opening pamac when i click in the notification for new updates icon. Its not something big issue, i just mention it. This is a problem with Pamac, but, not the same issue. It is no longer showing green for installed programs and orange for noninstalled ones. Only a brown color for all. To see what is installed I have to click on the program and see. Very annoying. Try change the icon theme, then you’ll see the difference. Some GTK icon themes, like the numix icons, are the cause of that. I see. How long has that been a problem? I have used Numix Square since switching to Antergos a few years ago, and, this is a relatively new phenomenon. I don’t know which one is the culprit here, but the previous version of Pamac didn’t show this. I don’t think Pamac itself changes the behaviour of an icon set, so it could be that the appearance already was there, but Pamac couldn’t display it. @Bryanpwo Thanks for the info. After looking at icons for the last bit, I guess I will just deal with it and hope the next version reverts to old behavior. 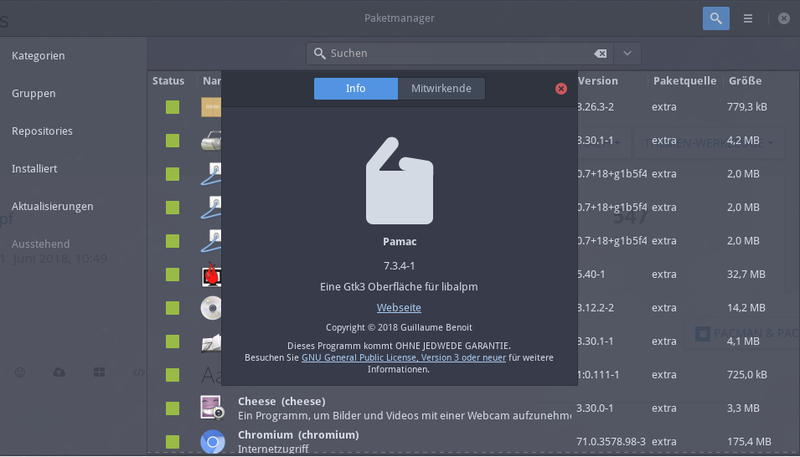 I have issues with new pamac too… antergos KDE, it always worked perfectly, but now very often I see red icon in sys tray, and it says “X updates available”. When I open updates window, it shows “System is up to date”. I close window, and sys tray says again - “X updates available”. Open main window again - “System is up to date”. @toxpal strange … anyone else see this under plasma? Can you provide journal log for pamac? Strange. I had a look at the images posted, and noticed that the sys tray icon is “new”, as in the red shield like with an “i” in the middle. I do not see this icon in the sys tray for my installations of Antergos. I “live dangerously” by updating Antergos every time I’m online and an update is available. My pamac installation is from the antergos repository, is version 7.3.4-1 and installed packages are pamac and pamac-tray-appindicator. @toxpal are those the exact packages that you have installed? Description     : Tray icon using appindicator for improved KDE support. I always had a “normal” icon until some update recently (a week or two ago), then icon was changed and now looks like a shield from Windows. I have 3 computers running antergos KDE, and all of them have exactly the same setup (and the same packages installed, except drivers, which are different on each computer). 2nd computer still has “normal” icon after all the updates, will need to check the 3rd (it’s in the office right now, so can’t access it). @toxpal It seems it has to do with the hardware, for some vague reason, on my KDE machine like @BlaiseD I have the previous icon.